Stop motion animation is a challenging and time-consuming skill that requires patience, adaptability, and a close eye to detail. 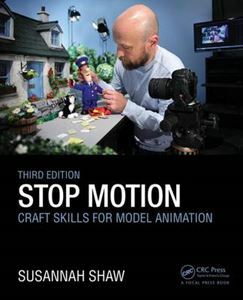 Stop Motion: Craft Skills for Model Animation, 3rd Edition is the essential guide to help stop motion animators overcome these challenges of this highly-skilled craft. Author Susannah Shaw provides a step-by-step guide to creating successful stop motioin films. Starting with some basic exercises, the reader will learn about developing a story, making models, creating sets and props, the mechanics of movements, filming postproduction, and how to set about finding that first elusive job in a modern studio.